Halloween is almost here, and I’m sure some of you need to do some last minute graphics for a client project or maybe so graphics for your Halloween party. 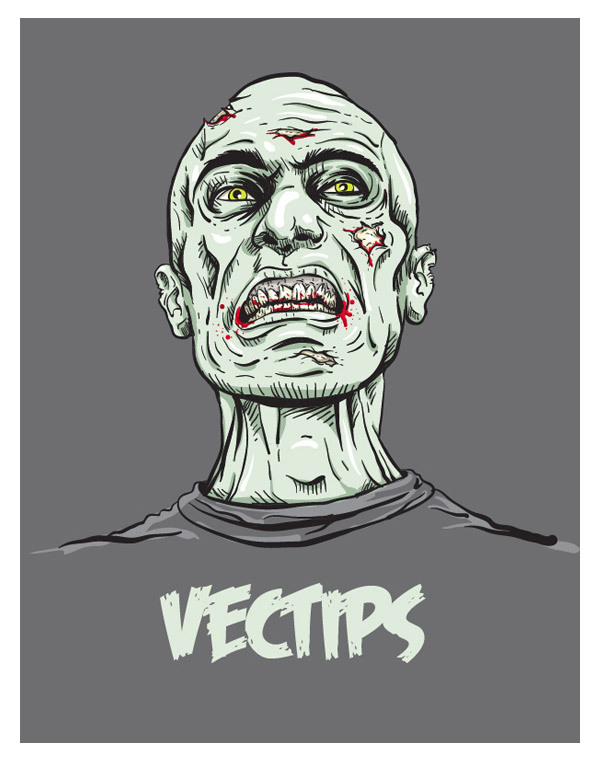 So in this intermediate tutorial you will learn how to create a zombie illustration with a pen tablet from a photo. Have fun utilizing the Blob Brush and Eraser tool in recreating this tutorial or apply these techniques to other ghoulish illustrations! 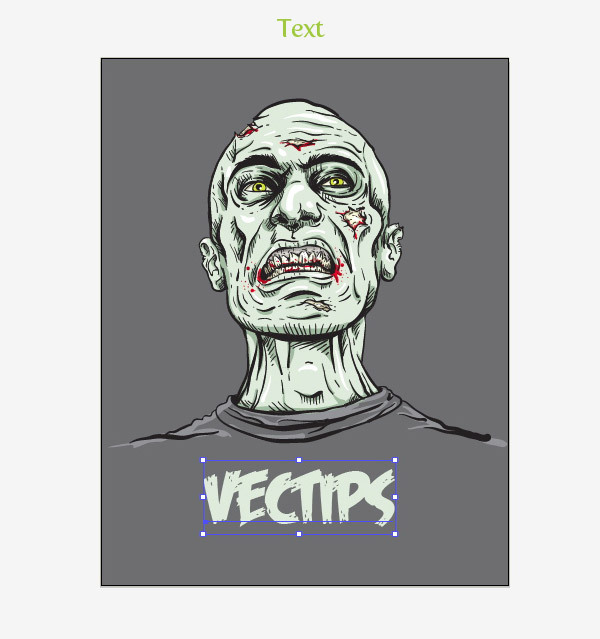 Below is the final zombie illustration we will be working towards. 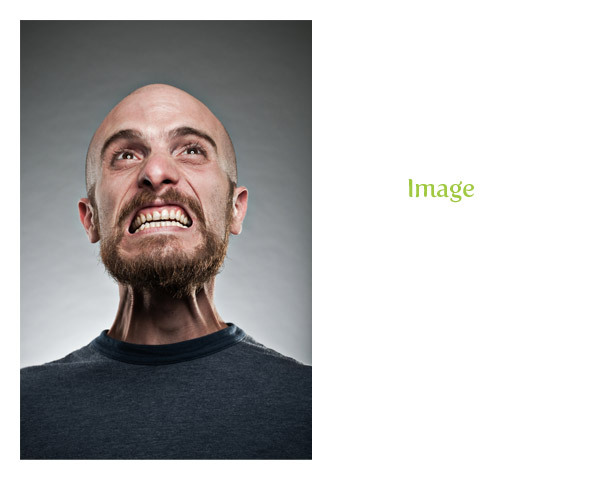 First, you need to find a scary or angry portrait to trace. I purchased a image from iStockphoto.com. You can do the same or take a picture of yourself. The resolution of the image is not hugely important, just make sure you can make out some of the face details in the portrait. Create a new document in Illustrator, go File > Place, navigate to the folder with your image, and click the Place button. 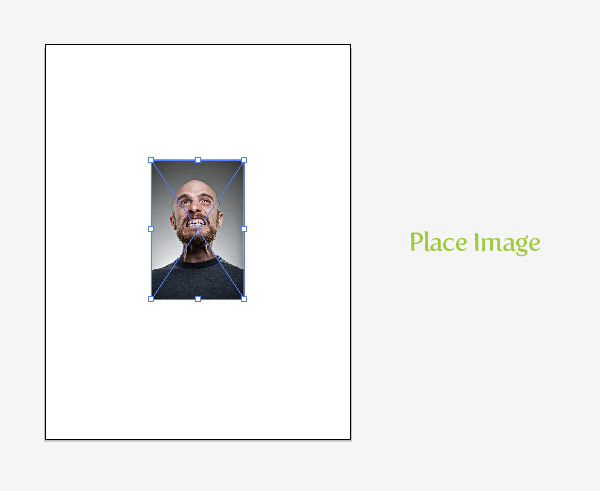 Once placed, use the Selection tool (V) and scale the image to your desired size. From the Layers panel, click the Lock icon on the placed image layer. To keep better organization of the layers, double-click on the image layer and rename it to “Image Template”. Next, press the Create New Layer button and rename it to “Outline”. We are going to do most of our tracing in the “Outline” layer. For tracing the image. We are going to use the Blob Brush (Shift + B). This is a new tool in Illustrator CS4, but if you have a version below, you can still use a Calligraphy brush (Refer to the Alternate Tutorial Methods step at the bottom of the post). The Blob Brush (Shift +B) settings are set using a pen tablet’s pressure sensitivity. For this tutorial, I am using a Intuos4 Medium sized tablet. If you don’t have a pen tablet refer to the same Optional Methods step as noted previously. 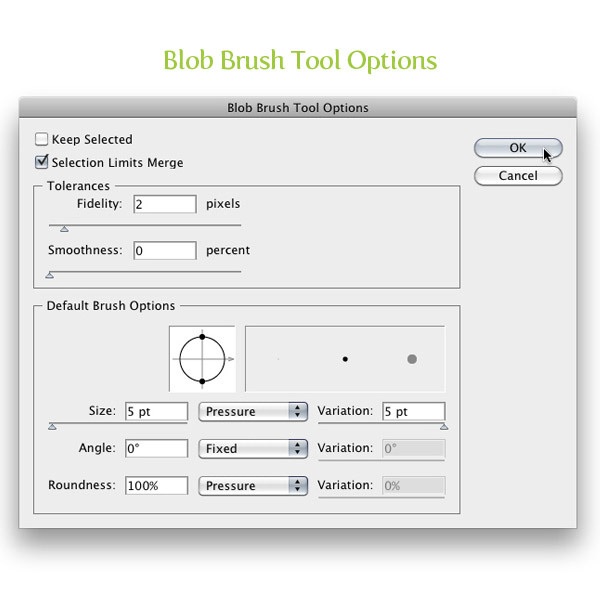 To set up the Blob Brush (Shift + B) to use the pressure sensitivity of you pen tablet, double-click on the Blob Brush (Shift + B) in the Tools panel to open the Blob Brush Tool Options. In the dialog, uncheck Keep Selected, check Selection Limits Merge, Change your Fidelity to 2, Smoothness to 0, Brush Size to 5 pt, select Pressure from the Size drop-down menu, Variation to 5 pt, Angle to 0, and Roundness to 100%. These Blob Brush settings will create a stroke that can be varied by the pressure of the pen tablet. Now that we have our Blob Brush (Shift + B) settings, we can start tracing the image. In the “Outline” layer, start tracing the predominate lines in the image. 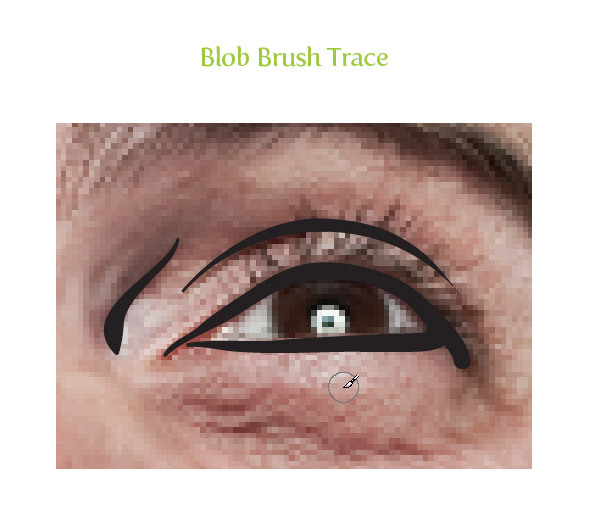 When tracing with the Blob Brush, vary the thickness of the stroke by applying less presses for thin parts of the stroke and more pressure for the thick parts of the stroke. When tracing the image I keep the Eraser Tool (Shift + E) handy for erasing mistakes and subtracting from the traced elements. You can set up the Eraser tool (Shift + E) to work like a subtractive Blob Brush (Shift + B). To set the Eraser tool (Shift + E) up, double click on it in the Tools panel. 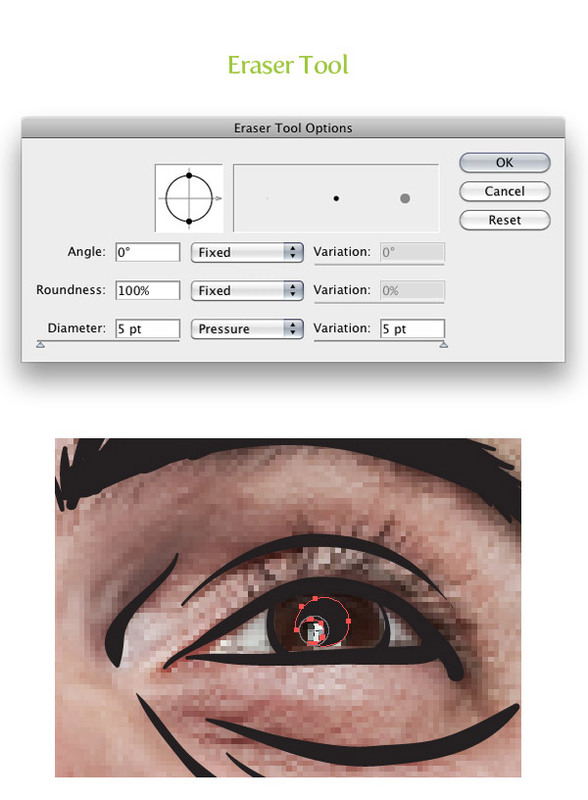 In the Eraser Tool Options dialog change the Angle to 0, the Roundness to 100%, the Diameter to 5 pt, select Pressure from the Diameter drop-down menu, and change the Variation to 5 pt. Now you can use the Eraser Tool (Shift + E) just like the Blob Brush (Shift + B) to correct mistakes and subtract from your tracing stokes. For example, I used the Eraser Tool (Shift + E) to subtract a highlight from the eye. Continue tracing and erasing the predominate lines in the image with the Blob Brush (Shift + B) and Eraser tool (Shift + E) until you have traced them all. You can exclude lines as you feel is necessary. 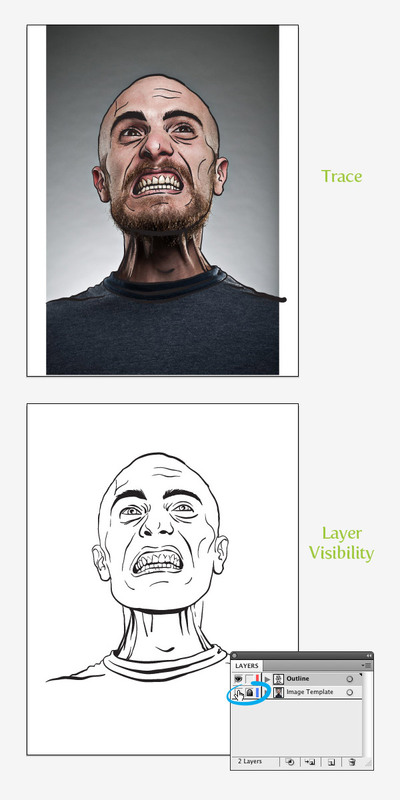 For example, in the image I chose, I’m not tracing the beard on the man’s face. You can also toggle the visibility of the “Image Template” layer to see how the outline is going by pressing the Visibility icon of the “Image Template” layer from the Layers panel. Now that we have the predominate lines, go through and add extra lines around the current ones, embellishing the features like eye sockets, cheek bones, mouth, and so on. Our zombie is starting to look pretty grisly, but let add some more horror with the Blob Brush (Shift + B) to the teeth and around the face. Add extra strokes to the teeth to make them look old and worn. Also, add more strokes around the face where the skin has ripped off. You can even use the Eraser tool (Shift + E) and erase sections of the head and ears where the skin has ripped off. Now that the outline is done, we can add some color. First, create a light green grey color from your Color panel and save it as a swatch in the Swatch panel. Next, select all the outlines and choose the Live Paint Bucket (K) tool from the Tools panel. Hover over the area you want to fill with the Live Paint Bucket (K), cycle through your swatches with the arrow keys until you find you light green color, and click to fill the area. Illustrator will then convert the strokes to a Live Paint Group. Continue filling in the area with the Live Paint Bucket until you have filled in the zombie. You might notice that it is hard to get every little area, but don’t worry, we will fill these areas in the next steps. Select the Live Paint group and go Object > Live Paint > Expand. With the Magic Wand tool (Y) select only the green color. Once selected, Cut (Command + X) the green objects. In the Layers panel, create a new layer, label it “Color”, drag the layer below the “Outlines” layer, and Paste in Front (Command + F) the green colored shapes. In the new “Color” layer, use the Blob Brush (Shift +B) to add shadows with a green grey color darker than your first green color. 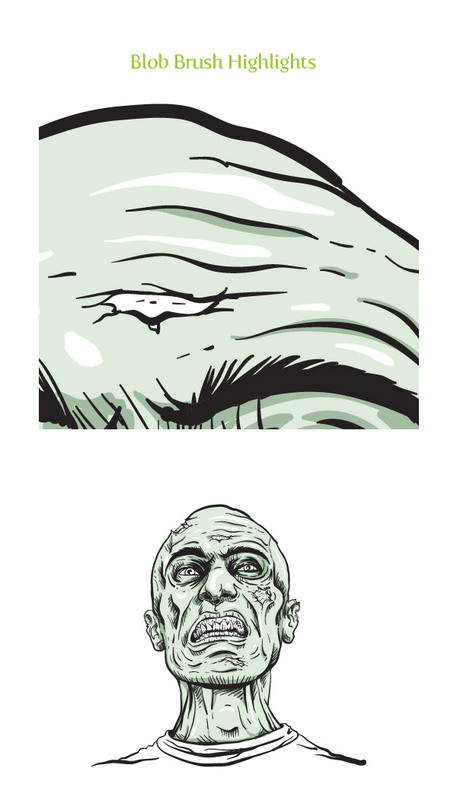 Use the Blob Brush (Shift + B) to create white highlights around the zombie’s face. Now we can start adding some other color to the teeth and exposed skull areas. Use varying shades of a dingy yellow color to color these shapes, and like the last couple of steps, use the Blob Brush (Shift + B). 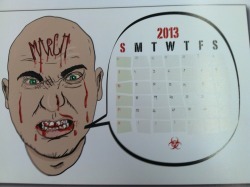 Add some more color to the illustration in the eyes and add some blood around the illustration. Create a new layer from the Layers panel, name it “Background”, drag it below the “Color” layer, and create a grey filled rectangle with the Rectangle tool (M) filling the artboard. Next, with the Blob Brush (Shift + B) create some light grey highlights on the top of the shirt. To add a little extra fun, place some type over the shirt. I used the font Feast of Flesh from Dafont and filled it with the same zombie green color in the face. Also, I shifted all the elements, except the background color, up. All done! 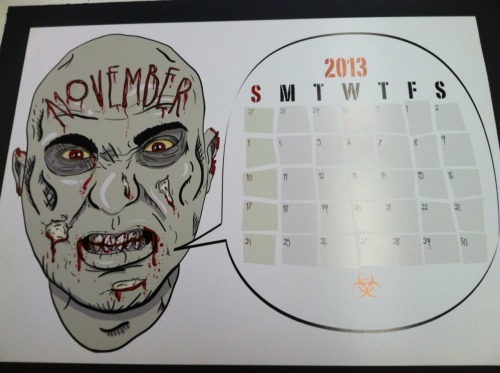 Hope you have fun with this grisly zombie! 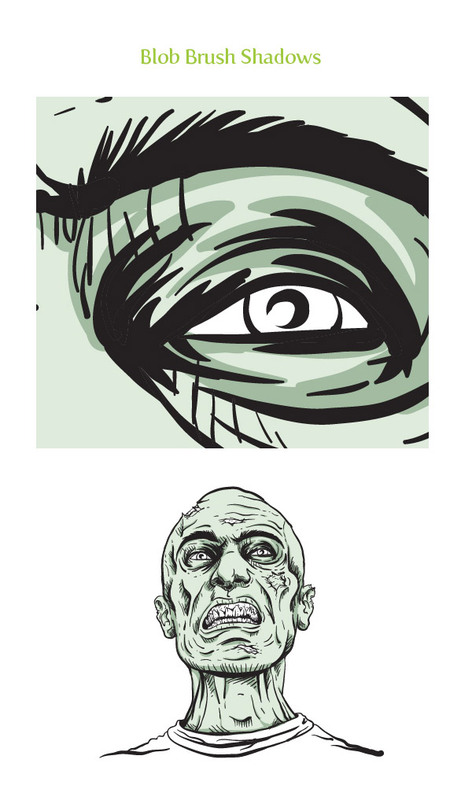 Again below is zombie illustration all done. 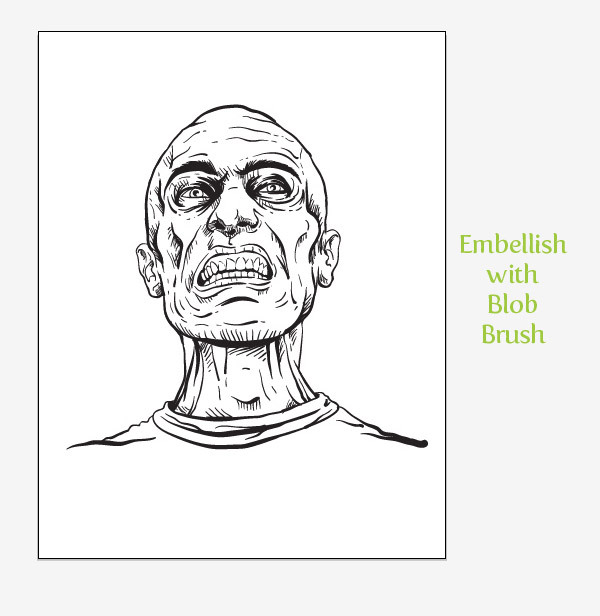 If you don’t have CS4 yet but you do have a pen tablet you can use a Calligraphic brush instead of a Blob Brush (Shift +B) for the outlines of the zombie. If you have CS3 you can use the Live Paint technique or you can just create shapes of color with the Pen tool (P), Pencil tool (N), or another tool of your choice. 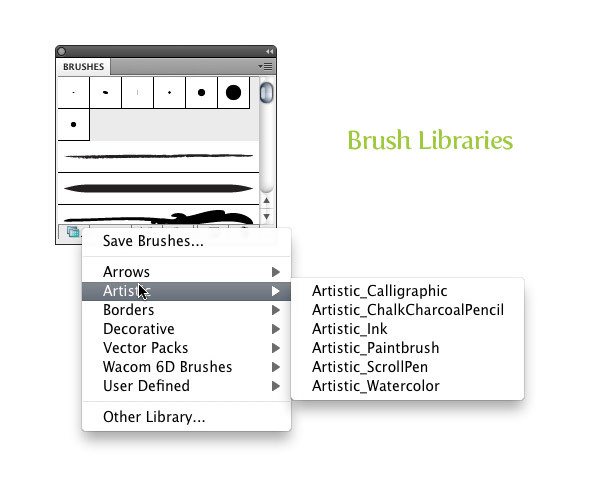 To set up a Calligraphic brush with the same settings as the Blob Brush settings in this tutorials, click the New Brush Icon in the Brush panel. 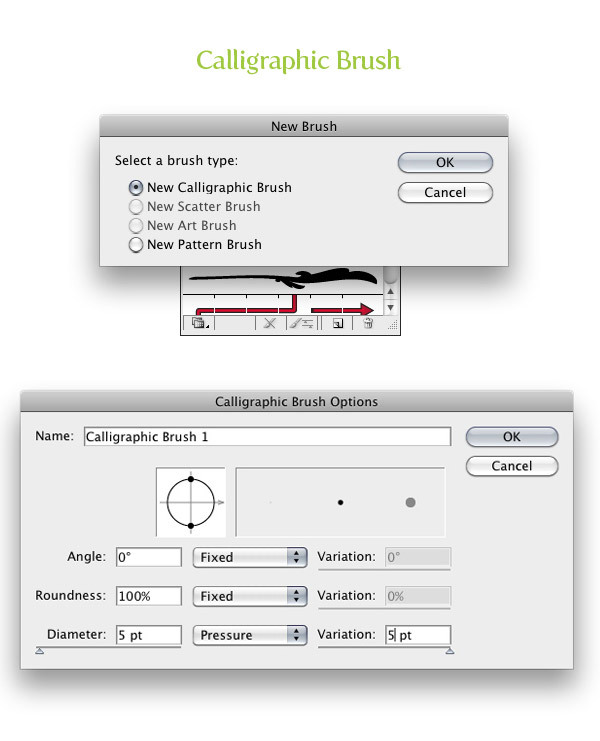 When the New Brush dialog opens, choose New Calligraphic Brush. In the Calligraphic Brush Options, change the Angle to 0, the Roundness to 100%, the Diameter to 5 pt, select Pressure from the Size drop-down menu, and change the Variation to 5 pt. Now you can outline the image with the same pressure sensitivity as the Blob Brush. If you don’t have a pen tablet, you can always use an Art brush for the outline instead of the Blob Brush (Shift +B) . Art brushes are still very versatile, but they will not use you pen tablets pressure sensitivity. Still, you can find a brush that has similar tapered lines. This technique is similar to the tutorial I wrote for Vectortuts called Illustrate a Grunge Style Talking Skull in Vector, so check it out to learn more. My previous article Create Sketchy-Style Vectors will help if finding and creating Art brushes. Having trouble with the live paint bucket. It wont let me color the face, only the brush strokes I made. Any Ideas? checked that, it makes me merge live paint, and then it colors every brush stroke instead of filling the face. First off, great tutorial! I just bought a bamboo and had to try it out on this zombie creation. Unfortunately when I select all and go to the live paint bucket and fill my area, all the paths that I created and altered with the width tool just revert back to the basic line. Did I miss something? please help! Thank you so much for this tutorial! I used it in a typography project for school and I am pretty proud of the outcome. (Hope I get a good grade!) Thank you! Thanks a lot, as I kinda learnt some tricks or two from it. Wow, this is perfect! I just bought a Wacom tablet and was trying to wrap my head about how to trace a portrait. This breaks down the steps for me very nicely. Thank you! Thanks for your tutorial. I like it. Great image great tutorial. This is actually the first illustrator tutorial I have ever done. I have followed all the steps. I have the outline complete, but when I start the live paint it converts all my brush strokes to simple lines. And takes away the calligraphy stokes I set up for my pen tablet. I am using CS3 that is what I was given in school. Is there anything I can do to fix this? First time I went through the tutorial I really thought the Outlining was done automatically by Illustrator (I am a total beginner). I love the effect, now all I have to do is get a tablet and learn how to use it. What a pity there is no easy way for people like me who are incredibly untalented in drawing. Nice. One question. I tried to make something similar but in the brush tool options pressure is not available options. Wondering where I’ve made mistake. why cant i choose the pressure setting? i have a tablet. What kind of tablet do you have? Your drivers may not be installed correctly, or at all. Once you install them, just restart AI. I could follow your tutorial to Step 10 but then hit a brick wall! When I try to Live Paint the green colour cast I get the X symbol under the paint can. I can only paint in the areas inside the highlighted areas instead of between. What I’m I doing wrong? Awesome! 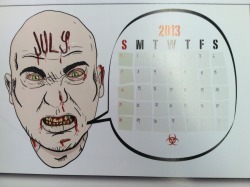 Makes me want to go out and make some zombie illustrations myself now! Thanks! – SHAZAM! really awosme job, totaly love it. This is just too cool, thanks so much for this! A lovely, incredibly detailed tutorial. I recently got a Wacom Intuos4 and so far have really enjoyed painting in Photoshop. I toyed with trying to make type with it in Illustrator, but I can see that it’s going to take much practice to get it right. Again, great work, and thanks. Wow, end result is fantastic, keep up the great tuts! Thanks for the alternate tutorial section for those of us who still use CS3. Very thoughtful. Great work, I need take tahlet tablet out of the closet. this may seem weird, though, but the man you used in the stock photo looks exactly like a man that was on conan o’brien last night promoting his DJ business…. anyone else notice this? Someone said that on Twitter. I missed Connan last night, wish I saw it! i’m glad someone else noticed! does anyone know if it’s the same guy? That looks awesome. Might have to give it a try shortly myself, as my tablet is collecting dust. Great tutorial! I’ve been wanting to try this for a while and now I’m going to. That is amazing! What brand tablet would you recommend? I have only used Wacom, but they have always worked great. I like your workflow, I haven’t used blob brush, but it looks awesome.